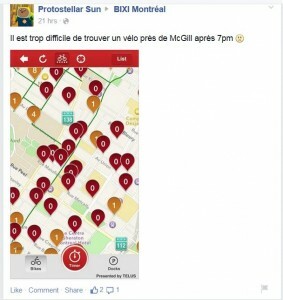 Has Bixi oversold its memberships? Bixi’s back with a vengeance this season. 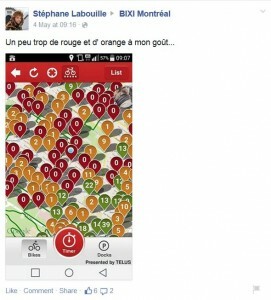 Last fall, the city of Montreal took over management of the financially-burdened company and announced that it had adopted a plan to fund and keep the beloved bikeshare service going for at least 5 years. This season’s launch was accompanied by celebrity bike designs, launch parties, and even rides by the mayor. As with last year, 5,200 Bixi bikes will be available at 460 sites in the city, as well as in Westmount and Longueuil. The service is off to a good start, with a record 37,386 members already signed up. That’s 4,000 more than it had at the end of last year, when skittish patrons weren’t sure if the bike-sharing system that filed for bankruptcy protection would survive. Good news for those of us who like the service, right? The problem is, Bixi still only has the same number of bikes and docks as in previous seasons. And there are increasing signs that the added demand is causing some problems. 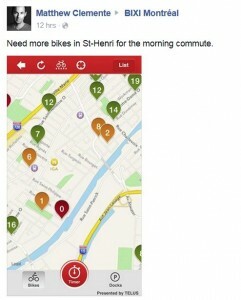 Other residential neighbourhoods such as Rosemont and St-Henri are reporting similar morning bike shortages. In the evening it’s the opposite, with the downtown core virtually empty of Bixis shortly after 5pm, and the bike racks in residential neighbourhoods full up shortly after. Bixi claims that its teams are “doing their best” to cope with “increased demand”. And it’s true. They have their trucks out, redistributing bikes as fast as they can manage. They have the depot stations in the mornings to cope with downtown rush hour traffic. They’re doing all the things they did in past seasons to manage this admittedly complicated logistics challenge. But with Bixi doing everything it can to boost revenue by selling as many memberships as possible, you have to wonder if the system is simply being pushed past its capacity. With with over 8 subscribers per bike signed up even before the start of the season, and with the vast majority of members wanting to use these bikes during peak periods, it stands to reason that there must be a tipping point. I’ll defer to smarter folks than I on how to work out the math. But, judging by the complaints pouring in from users across social media, I’m going to assume that we may already have reached that point. Has Bixi become so popular that it’s about to become the victim of its own success? It would be great if Bixi were to announce that it was expanding to cope with the increased demand. More bikes, more docks, more redistribution, maybe even expanded territory. All that would be welcome, but probably not politically feasible right now. After all, Denis Coderre might have been able to justify bailing out its debt and providing it with an annual subsidy, but a big capital investment at this point probably wouldn’t fly. Bixi’s membership is up right now, which is great. But how many of these members will join again next year if they could never manage to find a bike or a dock when they needed one? Previous post: NDP Victory in Alberta: Does this spell trouble for Harper?